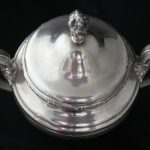 This is a Towle sterling silver sugar bowl. It has two handles and a removable lid. 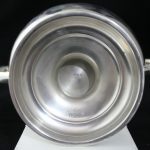 The bowl is decorated with a floral design. 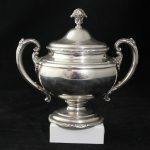 The bottom is engraved with “Towle Sterling” and the number “76540”. The item has no dents.